12 posts categorized "Nutella Creations"
I feel almost sheepish to write about the Pi(e) Day party my friends and I shared a month ago. I have been neglecting my blog for much too long thanks to a demanding work and training schedule. Plus I got very ill during my anticipated Nashville weekend. Long story short, I was busy catching up on life rather than writing about it. That doesn’t mean I have nothing worthwhile to share! 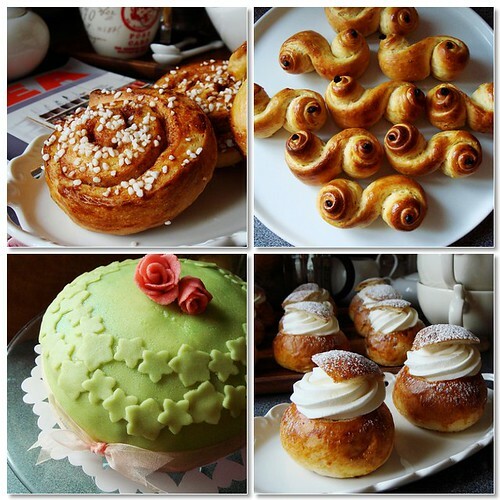 As a matter of fact, I have been busy with recipe development and testing in and out of the cafe. It feels weird to realize that this is now part of my job. Good thing that it is the part I enjoy. It is an amazing feeling to know that people pay to eat what I make when they have a million different ways to spend their hard-earned money. I can’t wait to tell you more about new recipes and dessert we are now selling at the cafe. 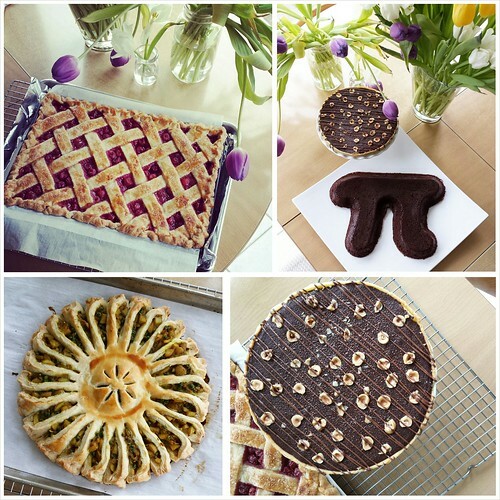 Today, I want to tell you what I made on Pi(e) Day. Pies, obviously. But what kind of pies? In my quest to build my own line up of candies, I am experimenting with ingredients and techniques that may not always yield winning results. Under normal circumstances, I would be disappointed but I am uncharacteristically calm about it all. Every one of my experiments is lesson to be learned. I discover processes that work for me, ingredient substitutions that end up with unexpected results, weaknesses with my technique, and concepts that fail to live up to expectations. This week I’ll take you through a few not-ready-for-prime time candies and explain why I am unsatisfied with the results. 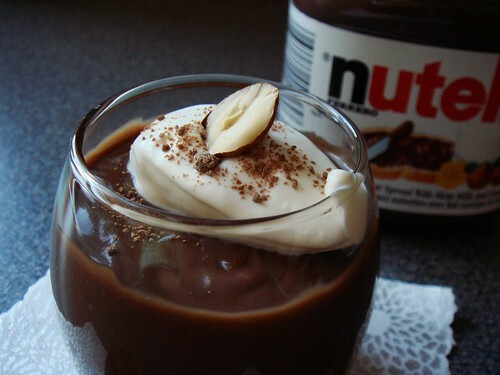 Nutella is a crowd pleaser so it is hard to go wrong with a filling made with the entire content of an economy-size jar. 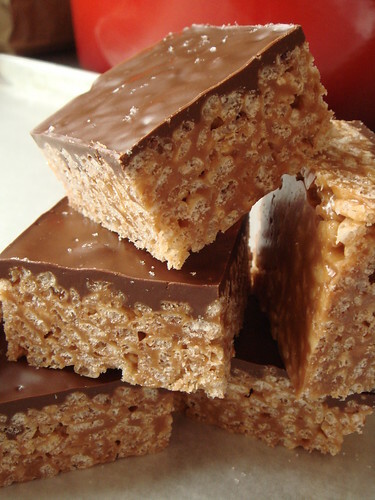 When I saw the recipe for Hip To Be Squares in The Liddabit Sweets Cookbook, my eyes lit up. Big batch and quick to make? Sign me up! The resurgence of homesteading has many of us puttering around the kitchen canning, preserving, baking, and cooking many things from scratch. My parent’s generation rejoiced in the convenience of processed food and all the free time it afforded them to do so much more. It’s funny how things have come full circle and we’re now clamouring for all things homemade. How far would you go to reach that elusive homemade label for what you put on the dining table? 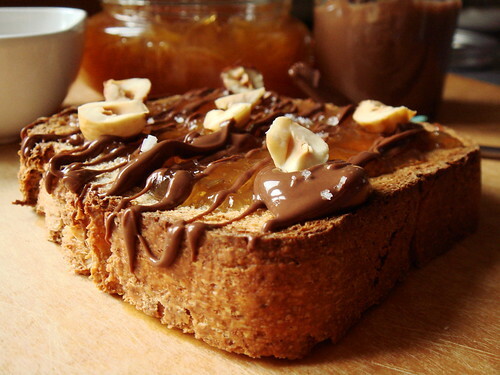 This week’s French Fridays with Dorie recipe is Nutella Tartine. At its heart, we have a slice of butter toasted brioche topped with marmalade, Nutella, toasted hazelnut, and fleur de sel. It is so easy to put together that a kid can do it in less than five minutes for a quick afternoon snack. But we’re on the topic of making things from scratch, aren’t we? Do you bake your own loaf of bread? 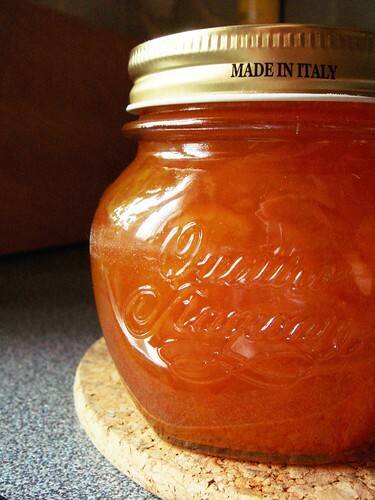 Grab a jar of marmalade from the larder that you lovingly canned at the height of citrus season? And that Nutella! Does it come from hazelnuts that you toasted and skinned and grinded with the best quality chocolate you can get your hands on? It’s amazing how a five-minute recipe can stretch into a multi-day cooking extravaganza. 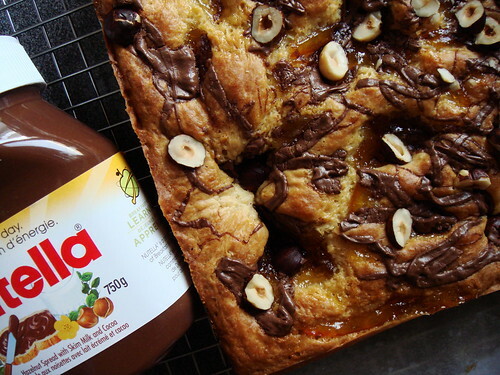 When it comes to Nutella-inspired dessert, restraint is the last thing on my mind. My contribution to last year’s Nutella Day was fun and whimsical in the form of icebox cake and buckeyes. This year, I want a rich and totally over-the-top cream pie. I took inspiration from the ever popular Nutella and banana crepe. 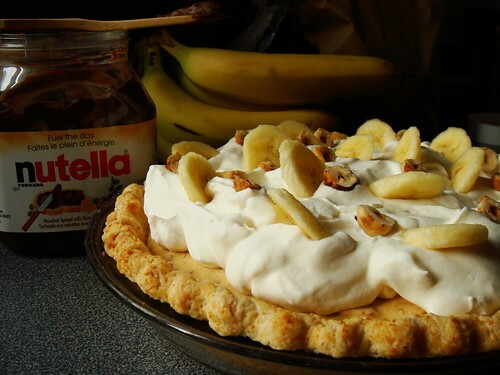 Add in a bit of British influence from banoffee pie, my Nutella Banoffee Cream Pie is born. Thanks to Ms Adventures in Italy, Bleeding Espresso for hosting another edition of World Nutella Day, I have an excuse to feed my Nutella obsession. This Nutella Banoffee Cream Pie starts with a buttery pie crust with a hint of crunchy graham cracker crumbs. It is filled with a thick layer of Nutella and a smooth layer of caramel banana cream cheese filling. It is crowned with billowy Chantilly cream and studded with banana slices and hazelnuts. The sweetness of Nutella is offset by the mildly tangy cream cheese. At the same time, the complex caramel undertone highlights a taste more sophisticated than plain sugary sweetness. I especially love the change in texture from crunchy to sticky to creamy to airy. This dessert is not for the faint of heart. If you’re not a fan of anything overly cute and precocious, look away and come back tomorrow. Still here? Good! Let me introduce you to another of my simple and effective creation. It definitely falls under the why-did-I-not-think-of-it-sooner category. Let me present you Nutella Buckeyes! The buckeye recipe in BAKED Explorations has been on my to-cook list as soon as the book arrived (you can find smitten kitchen’s adaptation here with recipe). 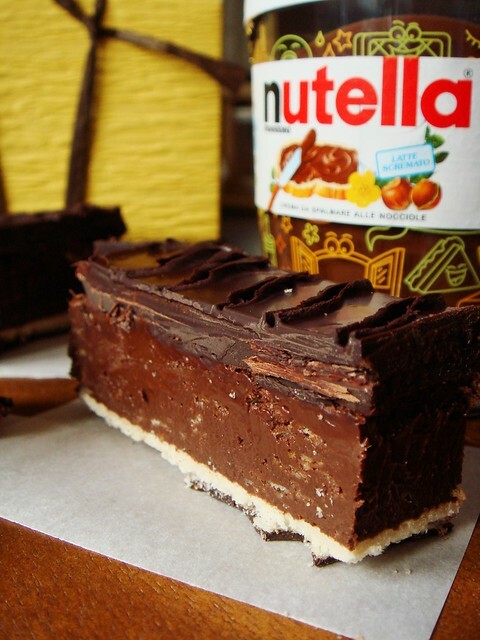 With World Nutella Day and Valentine’s Day both in February, there’s no better time for me to tackle this confection. My interpretation is very close to the original. The peanut butter is replaced by same amount of Nutella. With the cocoa content of Nutella, the candies are brown instead of beige. For a nicer contrast, I coated the candies with white chocolate tinted pink instead of dark chocolate. 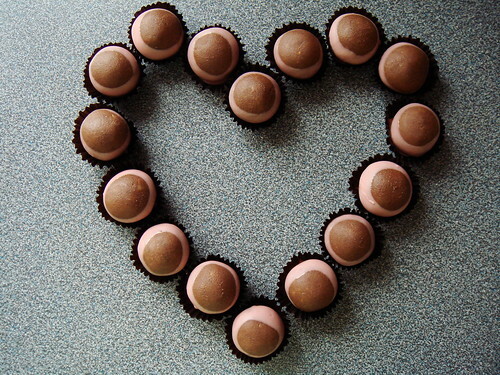 There you have it, Nutella buckeyes worthy of the sweetest Valentine! I didn’t know there’s a World Nutella Day until last year which fans of the hazelnut cocoa spread celebrate the deliciousness of the versatile Nutella. It’s a no brainer that I choose to celebrate by making a couple of delectable desserts. This is only part 1 of my contribution. Don’t forget to check out part 2 with the most girlish buckeyes you’ve ever seen! I rarely make dessert that involves “open packages X and Y and pile them in the same plate”. That doesn’t mean I don’t appreciate the convenience of such creations. It’s just not culinary challenging to interest me. That is the reason why I never made icebox cakes until today. Obviously, I’m not thinking of the standard chocolate wafers and whipped cream concoction. Taking a cue from my favourite cookie, what if the icebox cake consists of layers of graham crackers softened with Nutella pudding? The softened cookies with their nutty wheaty taste is perfect counterpoint to the pudding’s sweetness. The magic really happens while the cake rest in the fridge (icebox). Once the crunchy graham crackers soften, they take on the tender texture of cake. The profile of the cake looks like you’ve been slaving over the kitchen for hours with all the thin layers but in fact it took no time at all to prepare. Now that’s a dessert to tickle my fancy. I can't help it but food with funny names catch my attention every time. I want to say it again and again in a sing-song voice until people around me hatch up plans to end this misery. Luckily these catchy names often lead to pretty delicious bites so all is forgiven in the end. Case in point, Scotcheroo (say it outloud!). 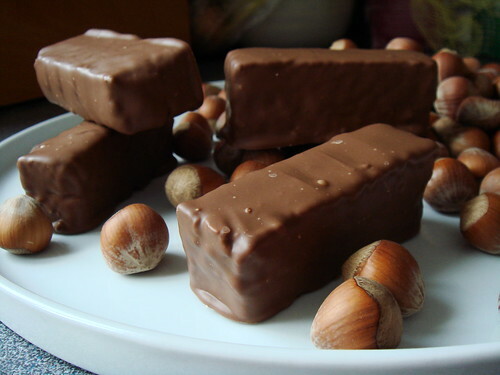 You may not have heard of Scotcheroo but its combination of familiar taste would surely catch your attention. At its heart, this is a fancy Rice Krispy treat. What's so special about it? Ditch the marshmallow and butter. The rice cereal is bind together with a delicious mix of Nutella, peanut butter, and brown rice syrup. As if that's not enough, it is glazed with butterscotch dark chocolate and sprinkles of fleur de sel. Just one bite and even you can forgive my annoying chant of Scotcheroo, Scotcheroo, Scotcheroooooooooo! The recipe for this decadent treat comes from David Lebovitz. It is so easy to make as long as you have all the ingredients ready. In fact, I think it would make for a fun little afternoon activity with the kiddies. I was a little skeptical of not lining the pan with parchment paper. However, after cooling at room temperature overnight, the bar popped out of the pan pretty easily for me to cut it up into neat squares on the cutting board. I quite like the balance of a not overly thick glaze. The dark chocolate and butterscotch definitely add to the taste of this sweet treat but the chewy crispy base remains the star. My memory of making Rice Krispy treat is not entirely pleasant. As a teenage, I remember pressing down the sticky mess into a pan yet could never get it to level. I was absolutely surprise how nice the Scotcheroo behaved. The mixture was not burning hot. Working from the center of the pan, I slowly pressed the mixture toward the sides of the pan until it was compact and flat. Simple! The glaze was also easy to work with. I poured the warm melted chocolate buterscotch mixture over the cooled cereal and swirled the pan until everything was evenly coated. 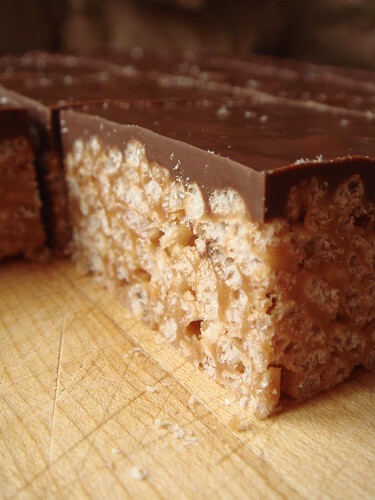 All no-bake bars ought to be this easy. I cut up these rich treats into 2.25 by 2.25 inch squares. It's just the right size to accompany a tall glass of milk or strong cup of coffee without being overly indulgent. However, for my own personal stash, I prefer to further quarter each square so I have a box of bite-size candies. After all, it is only the beginning of January and many of us have not yet abandone the "eat healthy" new year resolution just yet. I'm all for moderation! Of course, if you're really earnest about your resolution, I do have something else for you. Come back tomorrow and I'll show you the healthy incarnation of a similar treat.